Did someone say beer? Not just any beer...the best beer! 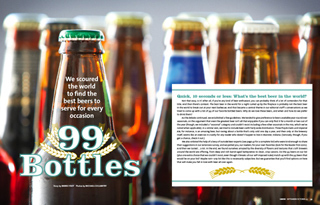 This month's Imbibe Magazine article titled "99 Bottles" lists the world's best beer. That's a lot of beer to sample but it looks like the Imbibe staff was up to the challenge . What I like about this list of the world's 99 best beers is that it combines the opinions of the Imbibe staff, outside beer experts, and readers to produce a balanced list with something sure to get any beer lover "hopped up". Also nice about this list is they grouped the beers into useful categories like "Beers to Drink with a Burger", "Different but Good", and "Beers to Serve to Your Friend Who Claims to be a Beer Snob". Some notable mentions for me were the Rogue Juniper Pale Ale that is the "closest a beer will ever come to tasting like a Gin and Tonic" and Anchor Steam (yeah local San Francisco beer!). So check it out. Hope you enjoy.